As the world becomes more connected through technology, new volunteering opportunities are also creating pathways for people to help each other and their communities. A study by the Australian Research Alliance for Children and Youth (ARACY), titled: 'Youth volunteering in Australia: An evidence review', found that the key benefits of volunteering for young people are both personal and social. The report found that volunteering can help children strengthen social relationships, develop skills and even enhance their career prospects. Recognising this, an increasing number of schools are actively pursuing student volunteering as a way to both improve student well-being and prepare them for life after school. 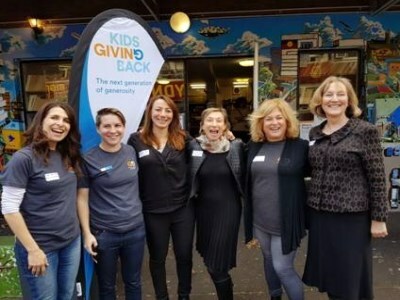 Last week, an organisation called Kids Giving Back – which describes itself as “a movement making it easy for kids to do good” – announced a new grant from the NSW Government. The $21,000 grant was provided by the Premier's Fund for Social Cohesion small grants program, which is aimed at celebrating diversity and inclusion. The money will fund the 'Food, Clothing, Shelter' project: a new Kids Giving Back volunteer program that aims to remove existing barriers preventing young people in Sydney’s West from engaging with the wider community. In 2017 so far, the charity has gained 10,000 student volunteers, cooked 36,000 meals for communities in need and worked with 84 charity partners and 39 schools. Ruth Tofler-Riesel, co-founder and director of Kids Giving Back, told The Educator that the idea behind the charity came out of a trip to Thailand that she took with her son. “The purpose of the trip was for him to help others and open his eyes to how other people live – but in fact, the adults gained as much as he did,” she said. Tofler-Riesel said that back in Australia, she and her co-founder, Carole Schlessinger, set to work developing Kids Giving Back, offering volunteering opportunities both in Thailand as well as in Australia. “It didn’t take us long to realise that charity really does begin at home,” she said. Jennifer Crossman, a senior advisor to the company’s board, has almost 40 years’ experience teaching English and history in both the public and private schools sectors in NSW. Crossman told The Educator that her interest in student volunteering first began as a teacher and deputy principal, and more recently through her role as a senior education consultant with Kids Giving Back. Crossman said that over the years, many of her students involved in volunteering experiences with people such as those impacted by homelessness, refugees or residents in age care communities, were made aware that relationships and social connections are “two of the most significant aspects of life”. “Parents would often comment that the experiences generated discussion at home. This in turn leads to a better understanding of each other and our world,” she said. Crossman pointed out that tor almost all of the 20th century most research about adolescence was based on “the idea that they are broken or in danger of being broken”. “However, our students have so many strengths and recent evidence shows that across the high school years, service learning experiences tend to help young people become more informed and engaged citizens,” she said. Crossman said it is important to involve young people in age-appropriate experiences, ensuring that they are meaningful. “It would be fair to say that kids love helping out. Each young person craves to be connected and to feel that their life is purposeful and important,” she said.